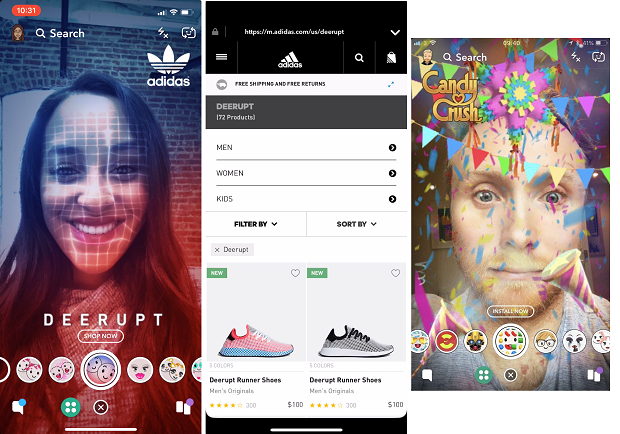 Snapchat is combining augmented reality with e-commerce with a new ‘Shoppable AR’ feature. Under the new system, Snapchat users in the UK and US can buy products via within the messaging and camera app. The technology works by letting advertisers add a ‘button’ onto any AR lenses they are running on Snap. This button has the ability to complete a number of actions, including directing users to retailers’ online stores or apps where they can purchase the products, all in a click. Website – the most “shoppable” capability, this gives users a tappable button to view an instantly loaded web page. Created for retailers and e-commerce companies to use an AR Lens to drive traffic to a product page, sign-up form etc. Video – combines an immersive AR experience with a long-form narrative in a simple tappable package. Full-length game or film trailers, short films, how-tos or behind-the-scenes footage, advertisers can add a video up to 1GB in size. Install – turn a gamified AR Lens ad into a DR unit with a button to drive app installs or re-engagement (opens the app if the user already has it downloaded).